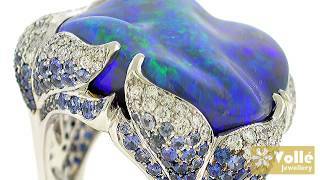 In the heart of Sydney you will discover Volle Jewellery. Volle Jewellery is your passport to the most beautiful Australian opals, South Sea pearls and Argyle pink diamonds that Australia has to offer. Volle offers an unparalleled jewellery experience for international visitors and locals, who are taken back to the Victorian era as they browse the most comprehensive range. They have something for everyone and every budget, from small gifts and souvenirs, to premium quality Australian gems. At Volle, they take immense pride in providing outstanding quality, unparalleled service and incredible value for money. Every gem purchased comes with a certificate of authenticity and an international guarantee. Volle has provided the finest range of Jewellery and gemstones. With a strong market presence and superb international reputation, a visit to Volle is simply a must for the most discerning of clientele. At Volle, their award-winning designers, expert gemologists, diamond graders, highly trained multi lingual sales staff and a truly unique interactive video experience will guide you through the wonders of Australia’s greatest treasures. If needed, their expert staff can even help you to create your own unique piece of Australian Jewellery, a memory of your visit that will last forever.